They’re not as close as they were two nights ago, but I managed to frame them with a more interesting foreground. This entry was posted in Photos and tagged Mercury, Stargazing, venus on March 8, 2018 by Kelson. 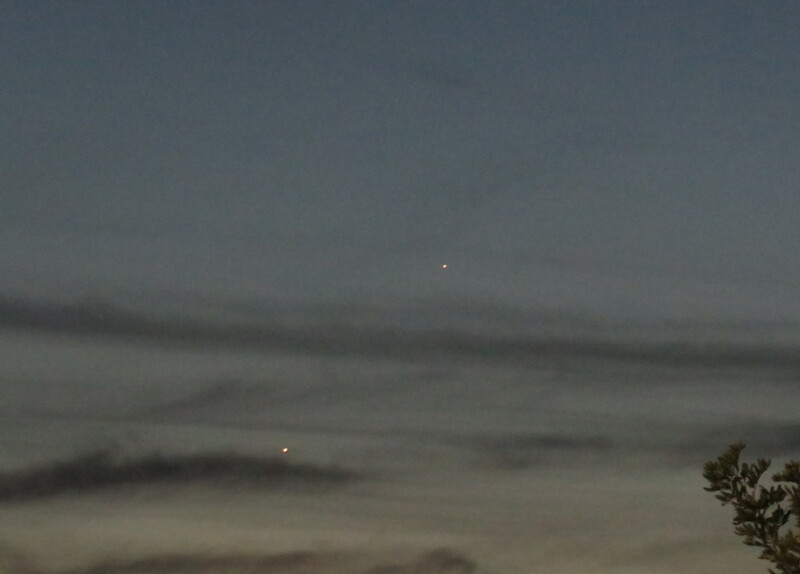 Venus and Mercury close together after last night’s sunset. I remembered they were going to be visible when I got to the store on the way home. The parking lot was both wide and slightly uphill from the western side of the street, giving me a clear view. The sky had just darkened enough to see both. The clouds were just wispy enough not to block them. As it is, I still had to crop out a street light and its lens flare to get this photo, or I would have framed it better. But hey, it’s not often you get to see Mercury from a city at all, never mind right next to another planet! This entry was posted in Photos and tagged Mercury, Stargazing, venus on March 7, 2018 by Kelson. I’ve been watching Venus and Mercury move toward and away from each other over the past week and a half as I leave the office, when I’ve had a clear view anyway. Tonight I caught a different view of the pair of planets, framed by the almost-bare branches of a tree. 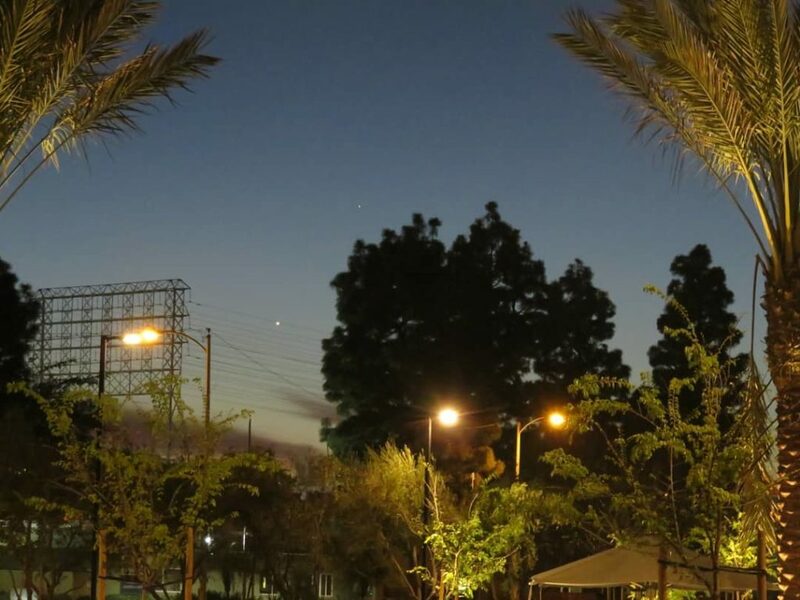 This entry was posted in Photos and tagged Mercury, Stargazing, venus on January 16, 2015 by Kelson. I walked out of the office building this evening and just stopped. There, framed by the treetops along the street and the awning and wall of the next building over, was clearly Venus, which I hadn’t seen in months (since the last time it was visible in the evening), and below it a pinprick that, unless I’m mistaken, was Mercury (which I’ve only ever seen on a handful of occasions). 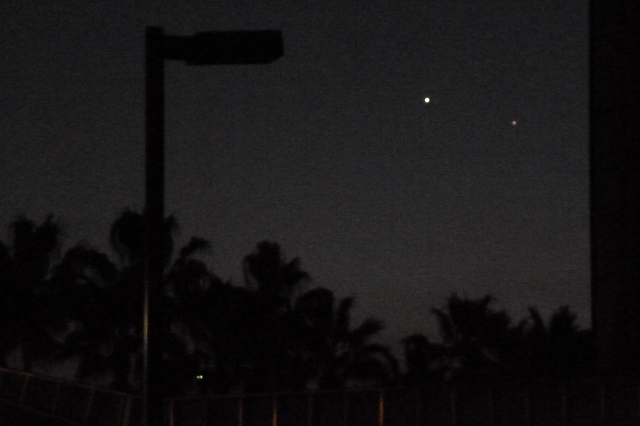 It’s certainly in the right place, and I waited to see if either light would move (there’s an airport literally across the street) before deciding that they were both planets. A few minutes earlier, Mercury would have been too faint. A few minutes later, it would have been below the trees. 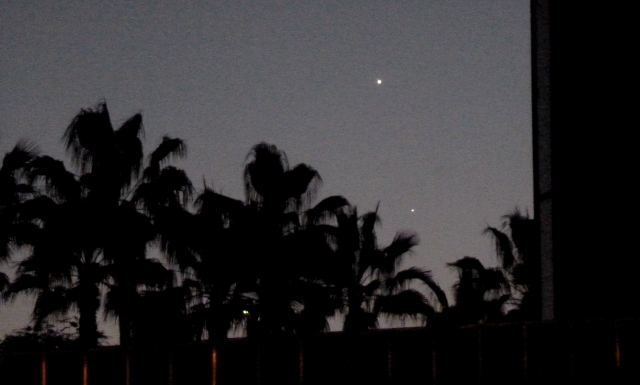 Not long after that, Venus would have been too low to see as well. Update! The next two nights were too cloudy to see anything, but Friday evening I was able to spot them again! You can really see how much Mercury has moved relative to Venus in just three days. Update 2! And here’s the view the following Tuesday, one week after the first shot. I had to move to the left a few feet since they were behind the building now, which is why the light pole is visible this time. In retrospect, I wish I’d snapped it in all three shots, because that way I’d be able to make sure I was presenting them all at the same zoom level. I’ve been eyeballing it, and I think it’s close enough to get the idea across. 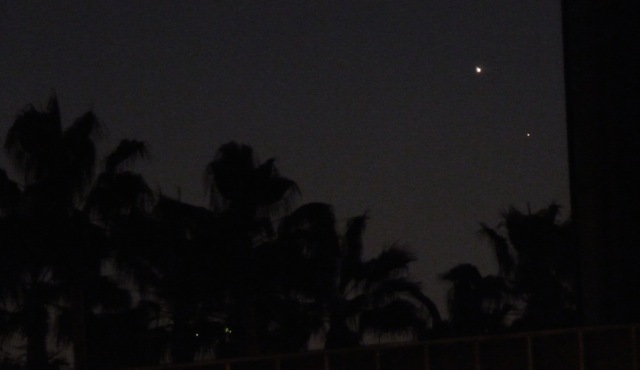 This entry was posted in Highlights, Photos and tagged Mercury, Stargazing, venus on January 6, 2015 by Kelson. 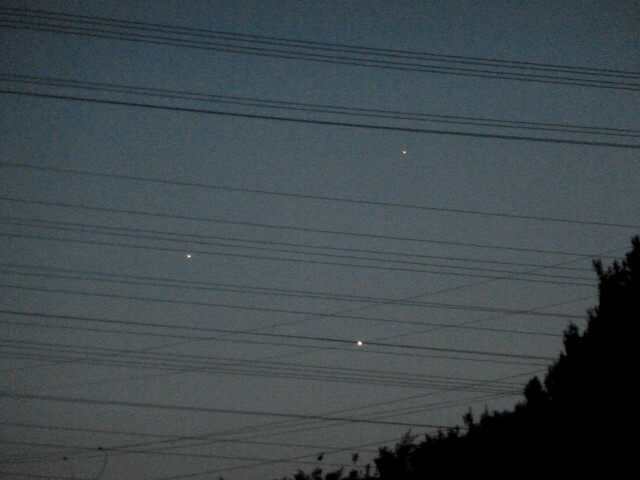 Last night I had a perfect view of the conjunction of Jupiter, Venus and Mercury, but only a phone. Tonight I had a more obstructed view, but I think the power lines ended up making it a bit more interesting than a plain photo with this camera would have been. It’s also astonishing how quickly Mercury moves. No wonder they named it after the god of speed. 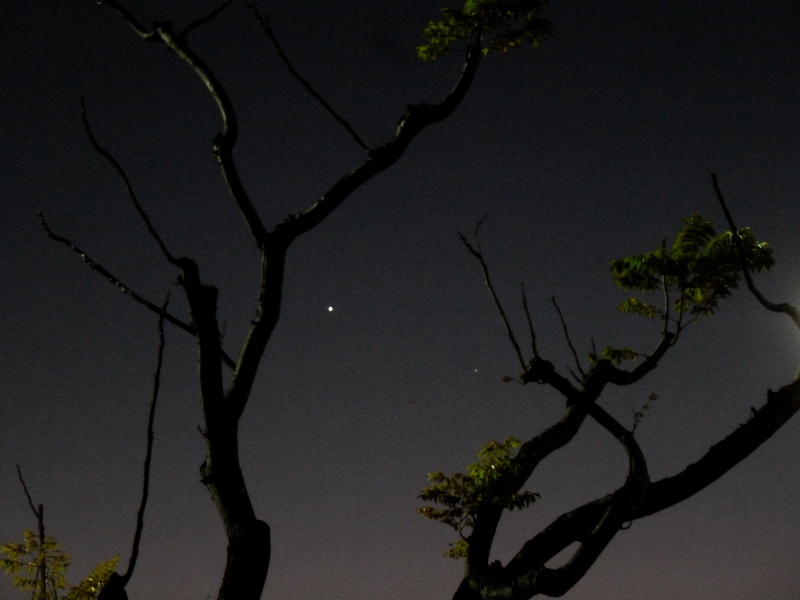 This entry was posted in Photos, Space and tagged Jupiter, Mercury, Stargazing, venus on May 26, 2013 by Kelson.